Ask anybody in the Pac-12, and they will say the Rice-Eccles Stadium crowd gives Utah one of the biggest home-field advantages in the conference. None of this would explain why the Utes, beginning their eighth season of Pac-12 play, have performed only slightly better at home than on the road. Is it possible there's a Myth of the MUSS? The Utes are 15-17 in conference home games and 13-18 away in the program's Pac-12 era. Those numbers surprised Ute coach Kyle Whittingham this week. 2011 • 2-3 (31-6 over UCLA). 2012 • 2-2 (49-6 over Washington State). 2013 • 2-3 (27-21 over No. 5 Stanford). 2014 • 1-3 (24-21 over No. 20 USC). 2015 • 4-1 (30-24 over No. 23 California). 2016 • 2-2 (31-27 over USC). 2017 • 2-3 (34-13 over Colorado). The Utes' losing record at home is not the fans' fault, with 52 straight sellouts. The school continues to evaluate expansion of the stadium; athletic director Mark Harlan has not publicly updated the project since starting his job in late June. In any case, Utah's increased level of campus support for football is a success story in this century. 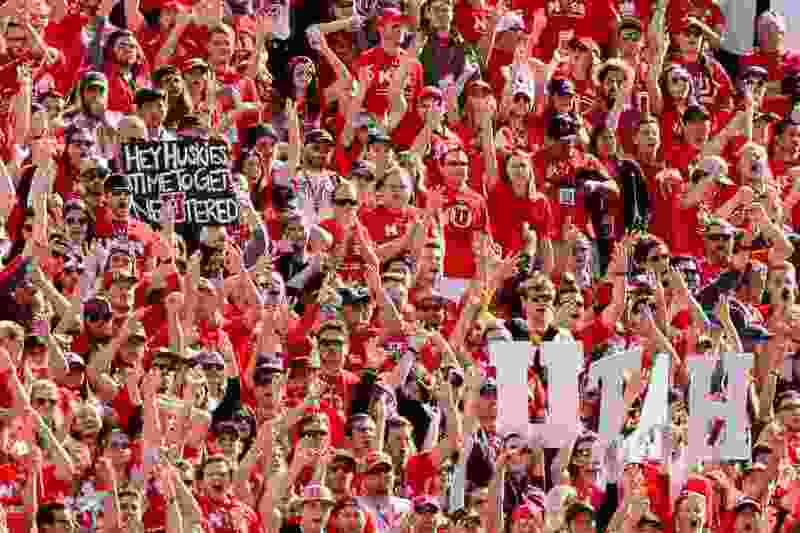 The energized Mighty Utah Student Section in the southeast area of the stadium is part of former coach Urban Meyer's legacy at Utah, which always was dismissed as a commuter school when it came to student involvement in Ute athletics. To say the Utes have adequately protected their house in this decade, though? That’s a stretch. Under Armour’s famous marketing campaign notwithstanding, the school’s apparel contract has not come with a guarantee of home-field dominance. Every Pac-12 school except California (0-2) has won at least once at Rice-Eccles Stadium since the Utes joined the league. Whittingham's decent road record endorses his program's toughness and consistency, traits that travel well. Yet a home crowd that's loud and involved in the game has witnessed more losses than wins in conference play. Even in the past four seasons, when the Utes have won bowl games, they're only 9-9 at home in the Pac-12. One disclaimer: Fans are convinced the Utes perform better under the lights at Rice-Eccles, and they're right. Utah is 11-7 in Pac-12 home games at night, an encouraging trend for Saturday's 8 p.m. kickoff vs. Washington in the annual “Blackout” promotion. The Utes have delivered some memorable home wins in the Pac-12 era — mostly at night and all requiring some clutch plays. • They upset No. 5 Stanford 27-21 on an October afternoon in 2013, when the Cardinal’s Kevin Hogan threw two incomplete passes into the end zone from the 6-yard line, needing 2 yards for a first down, in the last minute. The Utes needed a fourth-down stop, made possible when USC receiver Nelson Agholor stepped out of bounds on a fourth-and-2 reverse, and a drive that ended with Travis Wilson’s TD pass to Kaelin Clay for a 24-21 win in 2014. • Bobbie Hobbs' deflection preserved a 30-24 win over California in 2015, when Cal quarterback Jared Goff nearly overcame his five-interception night. And in 2016, the Ute defense forced USC’s first punt of the game and then drove 93 yards for winning TD pass from Troy Williams to Tim Patrick in a 31-27 victory, beating Trojan quarterback Sam Darnold in his first start. • Some losses are just as notable: Arizona in 2014, UCLA in 2015, and Arizona State in 2013 and ’17, with the Utes contending for a Pac-12 South title or seeking bowl eligibility. Circumstances can skew the home/road results, such as the conference's scheduling rotation and fluctuations of other programs. Those factors have made some road games more winnable than home games for Utah. The visitors' success started in October 2011 when former Utah president Michael K. Young came to town as Washington's leader and watched the Huskies take a 31-14 victory. Young has moved to Texas A&M and the Huskies have gone from Steve Sarkisian to Petersen as their coach. The Utes have improved since then, adding some on-field substance to the aura of their stadium. They’ll need both elements to beat Washington. When • Saturday, 8 p.m.